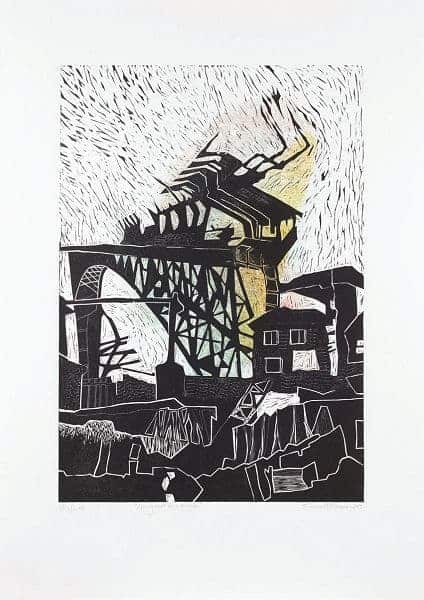 The Solo Studios Linocut Project was an initiative of seven artists participating in the annual Solo Studios event. The seeds of this collaborative fundraising project were planted in 2016, after the success of the first Solo Studios event. 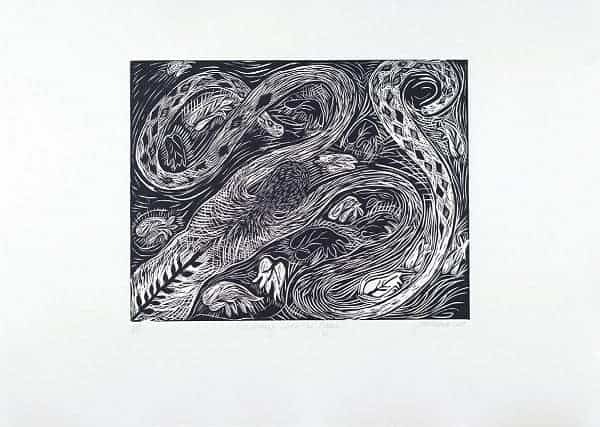 It was André van Vuuren who came up with the idea of a joint printmaking project, mainly as a way for artists to learn from and inspire each other. 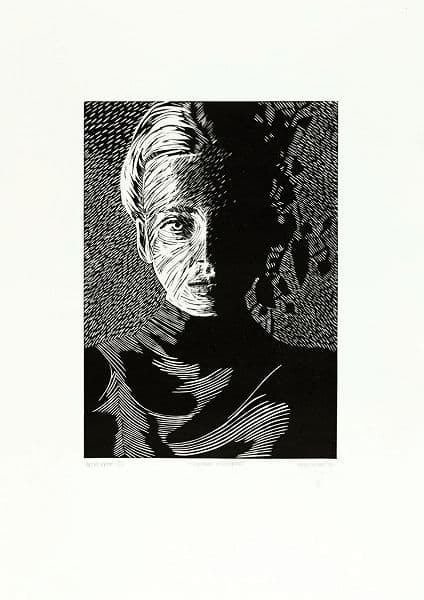 Linocut is a relief printmaking technique, in which a design is cut into a surface such as a woodblock or linoleum with a range of v-shaped chisels or gouges. 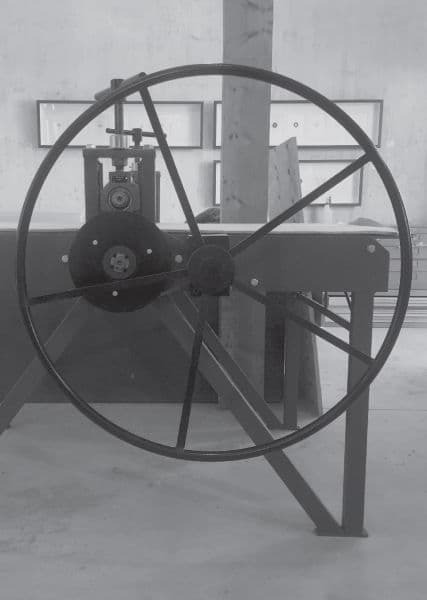 The completed block or sheet is inked with a roller, carefully covered with a clean sheet of paper and then impressed by hand or through an etching press. After the edition is printed, the original carved block is destroyed. In this the edition is rendered exclusive. 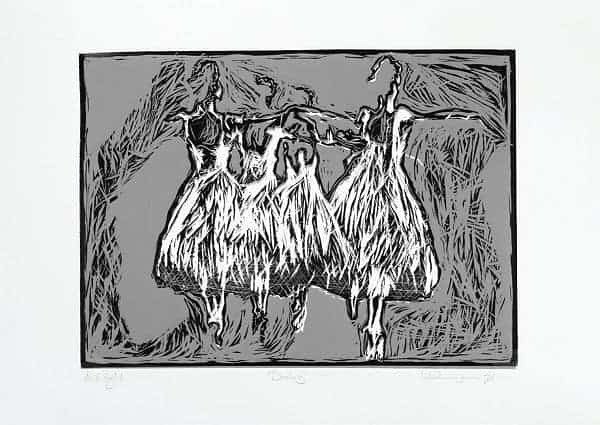 Other than a limitation regarding the size of the prints (71 x 50 cm), the 7 artists received a free hand and could use their imagination to produce a distinctive set of prints, showing mark-making unique to their own hand in the carving process, and then painstakingly printing the edition themselves. In their statements in this catalogue, the artists provide windows to their experiences, processes and ideas in creating these prints. The goal of the project is to raise funds for the continuation and development of the Solo Studios event through the sales of the exclusive, limited edition box sets of prints. The project has been structured in such a way that a percentage of the fundraising is earmarked for the advancement of underprivileged artists living in the Riebeek Valley. The vision is that Solo Studios artists will annually undertake a similar project. The Solo Studios Linocut Project can ultimately be described as a project by the artists for the artists. “At the Museum” is loosely based on the recent inclusion of some of my tapestries in a South African art museum exhibition and the scrutiny of audience engagement, or the possible lack thereof. Though more importantly, this print was an experience. Compared to the patience needed for the laborious process of weaving newspaper tapestry, linocut is a fantastically immediate process. I enjoy the spontaneity of cutting and precision of printing and I am also drawn to the bold lines and simpler blocks of colour. While the images I work with often have a sombre or unsettling undertone I hope a sense of play is evident. Spending time immersed in the world of printing ink and presses has yet again called into question the spontaneity and immediacy in my own art making practices and has initiated my current series of tapestries which explore the drawn line, a desire for fluidity and a sense of immediate expression. 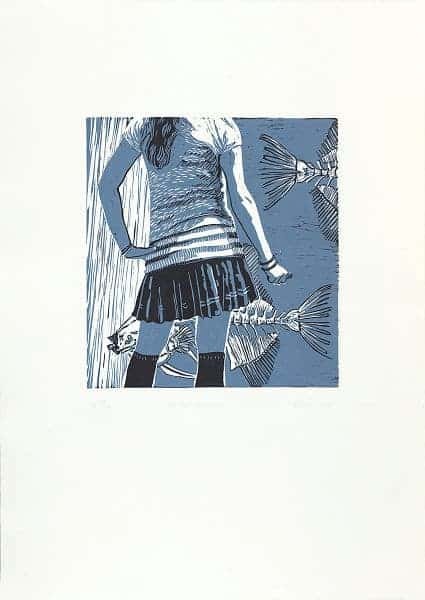 My work is generally more abstract but for this linocut I worked in a more figurative way. I loved, in particular, the immediacy of cutting the image into the lino and was once again reminded of my deep love for the printmaking process. This image pays homage to my interest in Buddhist philosophy, ritual and history. The nagas, which I refer to in my title, are water spirits or demons and these mythic beings are believed to cause disruption and disease when disturbed, but can also act as treasure holders or allies on one’s quest for balance and integration. In this image there is a symbiotic relationship between the female swimmer and the nagas, which helps her on her quest for wisdom and balance while exploring the shadowy, watery world of the unconscious. Sketching movement though dancing creates emotion that shows the viewer the power that is in the hands of the dancer, who channels it in the direction of his/her choice. A successful dance creates the hero, whereas an unsuccessful dance turns the dancer into a victim. This ambiguity runs true through all forms of art. It brings us closer to this concept of us depending upon our ability both to represent and present. To work metaphorically or figurative, while incorporating our point of view. This doubleness is precisely the ambiguity of the hero vs. victim that creates the ideal drama. This drama becomes personal and brings to it a more strictly illustrative element, and so brings it from performance closer to poetry or myth. There is an essential ambivalence and ambiguity in art and by removing creative barriers we as the viewers can begin to dance with ambiguity. Making this print was an opportunity to step out of my normal art making practice and to explore an entirely new medium. Unlike painting, which allows for the blending of individual marks, in linocut printing the marks are distinct. I was inspired by how Van Gogh used directional mark making in his paintings and tried to incorporate this into my print. The graphic quality of silhouetted watsonia buds in a landscape of fynbos worked for my image, although I could not let go of colour entirely and ambitiously chose to do a two-colour print. ...for me, the face contains landscape, still life, realism, abstraction and all artistic genres. It tells the story of the inseparable spiritual and emotional, the illusion of the separateness of man and nature. “Takhaar meisiekind” aims to guide the viewer to a visual choice between dark and light, the low between and an emotional choice between personality and the great singularity. With this, my first linocut print available to the public, I experimented with carvings similar to my brush strokes in oil, and strayed away from colour to pursue the communication of emotion. Tuxedo depicts a young man feeling thoroughly conspicuous dressed for his first formal occasion. yellow. The subsequent colours in the following order: pale grey, white, yellow-green, black and white again for the background. This process is repeated for each print of the edition. As each colour is laid down, more of the block is removed with the result that the print and the edition in it’s finished state cannot be increased. 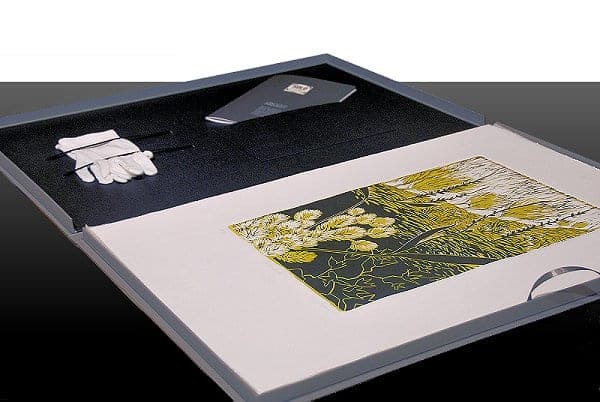 Woodblock printing is a very old medium, being in existence for some 18 centuries. It is very much alive and well especially in the East. Japanese and Chinese prints are arguably the best in the world and Indian cotton printed by hand is very popular. 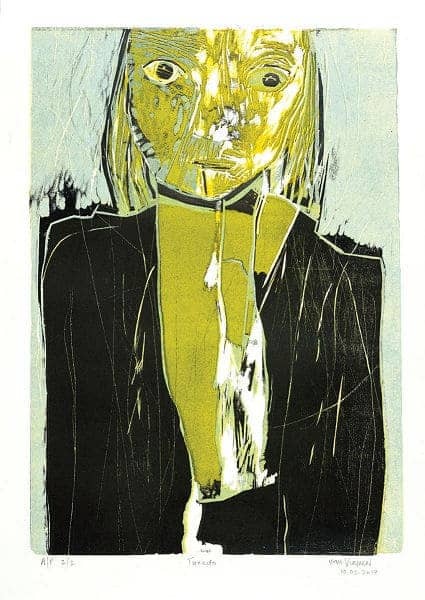 I would recommend all artists to explore printmaking because of the unique challenges and the huge sense of satisfaction gained. The theme of this series of prints relates to my interest in the social phenomenon of displacement. It seems that it has become increasingly difficult to live in urban areas and that more and more, people find their living spaces wedged in-between man-made structures such as flyover highways, skyscrapers and bridges. It is as if these constructions become characters in their own right, imposing a way of living on the inhabitants of homes in the area. 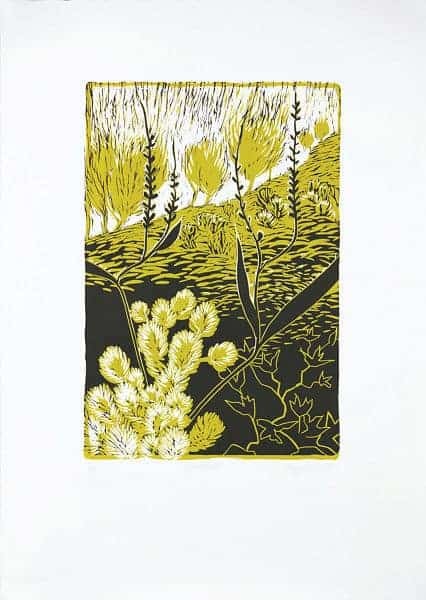 This series of prints is a combination of monotype colour printing, combined with linocut block printing. The intention with the style of mark making and colouring was to endow the bridge with the possibility of agency, to suggest the impact of the structure on its environment.